Awoooooooo ooooooooo oooooo arghh! What’s that?!? Encore, encore!? But of course! aaaaWWWOOOOOOO oooooooo oooooo …. I don’t usually leave comments but this cracked me the heck up. Right? I honestly laughed out loud before having my coffee. I am not the only one to crack up. That is funny. “The song of my people” got me I was cracking up! Anyone who has ever had a husky in their lives understands and feels this (have owned/been owned by two huskies!) The “song of my people” had me laughing and snorting over here! Oh wow… this cracked me up! Perfect perfect perfect! Thanks for the belly laugh! This was a much needed laugh today – what a great caption! 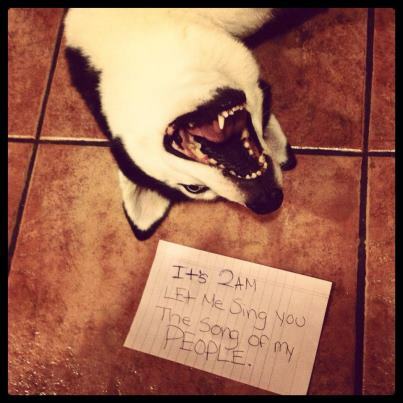 My favorite dog shaming ever and my very own dog is on the site! It’s the sign and the smile…….